Two years ago, Ashley Shaw suffered a tragic accident when a distracted driver turned into her as she was heading west on Lorain at Fulton, a notoriously confusing and crash-prone intersection for motorists, cyclists and pedestrians alike. She fell off her bike, which landed on her back and gave her a concussion. Although Shaw didn’t know it until a few days later, when she collapsed on her kitchen floor, her injuries were quite serious. Two years later, Shaw still has lingering health issues from the crash. Although she’s remained resolutely car free, she doesn’t bike nearly as much as she used to because she’s apprehensive about getting on the road unless there’s a protected bike lane, something that doesn’t yet exist widely in Cleveland. The Ohio City resident now advocates for safer streets as director of neighborhood planning and economic development for Ohio City Incorporated (OCI). She’s also co-chair of the enforcement subcommittee for Vision Zero, an ambitious new effort helmed by Ward 15 councilman Matt Zone and city operations chief Darnell Brown that aims to “eliminate all traffic fatalities and serious injuries, while creating safe, healthy, equitable mobility for all,” according to the website. Shaw’s accident is hardly an isolated case. In fact, crashes involving pedestrians and cyclists are up from east to west, from deaths to more minor collisions. In September, British singer Gary Numan’s tour bus struck and killed a 91-year-old man crossing the street at East Ninth and Superior, prompting a “devastated” Numan to cancel his show at the House of Blues. An RTA driver struck and killed a pedestrian at Public Square in December. More recently, a man was killed in a hit-and-run crash while crossing in a crosswalk in Cleveland’s Clark-Fulton neighborhood. And those are just the most tragic and publicized incidents in recent memory. A quick search of a local Twitter police scanner account lays out dozens more instances in just the past six months, and 2017 Ohio Department of Public Safety data, which only tracks accidents that result injury, death or property damage of more than $1,000, shows about 100 hits touching every corner of Cleveland. For many, that’s not a surprise at all. Transportation design and policy has long favored cars over everything else, and Shaw and others point out that safer streets in Cleveland are quite literally a public health issue. Across town in the Buckeye-Shaker neighborhood, former school crossing guard Lucille White has similar concerns. A few years ago, after witnessing cars speeding heedlessly through school zones on East 116th Street at Larchmere and Shaker Boulevards while she was crossing youngsters, she whipped out her phone and began filming them. She complained to police, who sent out a car but didn’t have the resources for ongoing enforcement. When her boss threatened to fire her for filming reckless drivers, she says she quit out of frustration. And in University Circle, Lakewood resident Sophie Roussel-Kochheiser commutes by bicycle to her administrative job at Case Western Reserve University’s School of Medicine. Or at least she did, until she was knocked off her bike last year by a hit-and-run driver who turned left into her as she was traveling west at Superior and West Sixth Street, yelled at her out the window, and then kept driving. “I’ve never been that terrified in my life — I’m a commuter, so I go next to trucks and whatnot, but this was truly terrifying,” says the 56-year-old. Despite video from security cameras, the police never found the culprit. Unfortunately, the accident destroyed her bike. Zone says that while the city of Cleveland has made impressive progress towards implementing its Complete and Green Streets Ordinance — adding more than 70 miles of bike lanes from 2013 to 2017 as well as over 60 crosswalk enhancements in 2016 alone — it is not clear that ordinance is being properly enforced and more must be done to create safe, multi-modal streets for everyone in Cleveland. Zone’s vision for Vision Zero is to create a plan that will be adopted by the mayor and city council. “We need to make a bold statement by passing an ordinance that will mandate change at city hall and how we function as a city,” he says. Vision Zero began 20 years ago in Sweden, which now has one of the lowest annual rates of road deaths in the world (three out of 100,000 as compared to 12.3 in the U.S.). Based on the idea that loss of life is not an acceptable price to pay for mobility, it places the responsibility for accidents on system design, infrastructure design, vehicle technology, and enforcement. Through managing speed, traffic calming measures on high-accident roadways, pedestrian and bike infrastructure, and public engagement, eliminating deaths and serious injuries from traffic crashes can be possible, advocates say. Although Vision Zero may sound like a fantastically unrealistic moonshot of an idea in car-centric Cleveland, the city needs to act now to prevent more crashes, advocates say. In recent years, Cleveland and other cities have seen a rise in walking and cycling, higher rates of distracted driving, and more cars and especially more lethal SUVs on the road due to low gas prices, and this has created a kind of perfect storm that has caused the number of crashes to rise dramatically. From 2015 to 2017, the most recent statistics available, the city of Cleveland had an 82 percent increase in pedestrian fatalities and injuries compared to 2012 to 2014. Bike injuries and fatalities were down 28.7 percent in the same period. Across Northeast Ohio, crashes involving bikes and pedestrians are also on the rise. According to the Northeast Ohio Areawide Coordinating Agency (NOACA), a transportation and environmental planning agency serving Cuyahoga, Geauga, Lake, Lorain and Medina counties, pedestrian fatalities are up 67 percent in 2015 to 2017 compared to 2012 to 2014, while pedestrian injuries are up 23 percent in the same period. While bicycle fatalities are up 400 percent (from two to eight), bike injuries are actually down 25 percent. Ohio also saw an increase in pedestrian related fatalities (35 percent) from 2016 to 2018 compared with 2013 to 2015, while serious injuries remained basically the same, according to statistics from the Ohio Department of Transportation (ODOT). Nationally, pedestrian fatalities are at a 25-year high, according to the Governors Highway Safety Association. 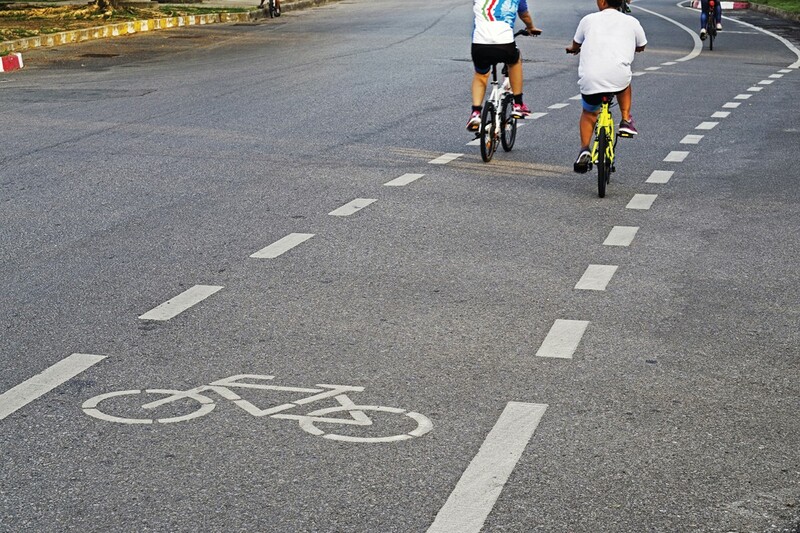 Statistics also show that while the overall number of bicycle accidents in the country is declining, the number of fatal bike accidents is on the rise. Speed is one reason crashes are on the rise, according to ODOT; in fact, studies have shown that nine out of 10 pedestrians will survive when hit by a vehicle traveling 20 miles per hour, whereas only one out of 10 will survive when the vehicle is traveling 40 miles per hour. The agency also cites lack of safe, separated infrastructure for people walking and biking; alcohol and drug impairment; a rise in distracted driving; increases in vehicle traffic; and an increase in the number of bicyclists and pedestrians on the roads, whether because of choice or economic necessity. Can Vision Zero Work in Cleveland? Zone introduced a resolution creating the Vision Zero task force in January 2018. It has been meeting since last year and has five active subcommittees, all co-chaired by a citizen and city official, except for design/engineering which (ironically) is arguably the most important one. Specifically, enforcement is being co-chaired by Department of Safety traffic commissioner James Muhic and OCI’s Ashley Shaw; education and engagement is being co-chaired by the Department of Health’s Jessica Jurcak and Wayne Mortenson of Cleveland Neighborhood Progress; maintenance and vehicle fleet is being co-chaired by Terrell Cole from the mayor’s office and bike attorney Ken Knabe; data and evaluation is being co-chaired by Jacob VanSickle, executive director of Bike Cleveland, and Ward 3 councilman Kerry McCormack; and design and engineering is being co-chaired by traffic engineering commissioner Rob Mavec and planning director Freddie Collier. Other agencies like Bike Cleveland and NOACA are also involved, indicating a broad-based, collaborative process, and meetings are apparently open to the public. About 20 to 25 people have been showing up at regular task force meetings. In recent years, more than 40 U.S. cities have publicly signed on to Vision Zero, according to the Vision Zero Network. Vision Zero cities must have a clear goal of eliminating traffic fatalities and severe injuries; a mayor who publicly, officially commits to Vision Zero; a Vision Zero plan or strategy in place; and key city departments (police, transportation, public health) that are fully engaged. Leading cities include Seattle, San Diego, Boston, Washington, D.C. and Chicago. New York City is the shining example. Last year, the city completed 138 street improvement projects and added more than 20 miles of protected bike lanes. Queens Boulevard in Queens, once nicknamed the “Boulevard of Death,” was given a road diet by eliminating some lanes and lengthening the timing of walk signals. There have been no pedestrian fatalities there since 2014, and the number of traffic deaths in New York dropped in 2018 to the lowest level in more than a century. Still, it’s not all good news. The number of pedestrians killed in New York actually increased last year. Yet even so, the number of bicyclist deaths dropped last year to 10, from 24 in 2017. Other cities that have adopted Vision Zero have taken similarly bold moves. For example, in January 2018, Portland, Oregon, reduced its speed limit on residential streets to 20 miles per hour. Boston reduced its default speed limit to 25 miles per hour and implemented a “slow streets” program to calm traffic to 15 miles per hour in some residential areas. Philadelphia targeted high-injury network streets that produce 50 percent of traffic deaths and severe injuries. Of course, Cleveland isn’t generally included with those cities when it comes to progressive street design and policy, and the city is sometimes slow to adopt cutting-edge trends. We’ve also built some really dumb bike lanes in recent years, including ones where the buffer is between the rider and the curb and not the rider and the cars. However, there are hopeful signs that Vision Zero can force the city to make changes earlier than it typically does. Vanterpool says that cities that adopt successful Vision Zero plans put significant fiscal resources toward implementation, show strong leadership behind the Vision Zero commitment, and use a data-driven approach. “Vision Zero is not meant to be intersection by intersection but a look at the system of mobility and the influencers of that system,” she says. Yet despite the obvious need for traffic calming in Cleveland —speed-limit enforcement has almost disappeared since the city’s traffic cameras were eliminated, pedestrians have to play frogger when crossing many busy roads, and many kids walk to school on unsafe streets — transportation advocates report that the city isn’t implementing its own Complete and Green Streets legislation. For example, the city regularly repaves streets rather than adding bike and pedestrian enhancements, and even when bike lanes are added, they’re not protected. According to subcommittee meeting minutes, the design/engineering subcommittee is considering short-term solutions such as traffic signal timing and leading pedestrian intervals (where the crosswalk gives pedestrians a head-start over traffic); midterm solutions like re-striping plans, low-cost traffic calming, and on-street parking changes; and finally, long-term solutions like complete street overhauls. Yet everyone is frustrated with the city’s implementation of its Complete and Green Streets ordinance, designed to create a network of streets for all users while incorporating green infrastructure. Councilmen Zone and McCormack are currently working with Bike Cleveland and others to update it and remove loopholes. As it stands now, on a routine paving job, the city often “mills and fills” without adding pedestrian and bike enhancements. The Capital Improvements Office also hasn’t provided an update on the Complete and Green Streets ordinance implementation since 2016, even though the ordinance says they’re supposed to. In terms of enforcement, many observers note that neighborhood speed enforcement is not a priority. To be fair, resources are an issue. The enforcement subcommittee is developing a new close-call form and database on Bike Cleveland’s website that allows people to log where accidents nearly occurred or where dangerous intersections or roadway conditions may exist. Traffic enforcement could take action after receiving repeated calls about trouble areas. The education/engagement subcommittee is currently working to develop a brand or logo for the Vision Zero webpage on Bike Cleveland’s website. There are at least 26 education programs about roadway safety in Northeast Ohio, Mortenson says, some of which may be duplicative. They “want to streamline and reinforce investment in education programs that are working,” he says. The city’s bike lanes are not well maintained in the off-season, and the maintenance/vehicle fleet subcommittee is working with the Metroparks and the city to try to fix this. Finally, the data/evaluation subcommittee is working to map fatal crashes from 2013 to 2017 and to collect supplemental reports detailing age and race. From there, they’ll identify hotspots that need additional enforcement, public engagement, and roadway redesign. Redoing intersections and other larger-scale interventions may be tough to do given the city’s limited means, some advocates say. Look to Franklin Boulevard, which has a 35-mile-per-hour speed limit that residents say encourages speeding, for how Vision Zero might play out. The proposed re-do that was unveiled this fall includes curb extensions, raised crosswalks, neighborhood traffic circles and rectangular rapid flashing beacons (RRFB) or pedestrian crosswalk signs. Although this project is not yet funded, the recently adopted NOACA plan makes it much more likely that it will eventually become a reality. Fulton Road is being redone this year from Clark to Lorain, and there are plans to add a new traffic circle at Franklin as well as RRFB crosswalks and bike lanes. Yet it still doesn’t include a continuous protected bike lane, even though advocates say there’s enough room for one. According to VanSickle, the city’s excuse for not adding protected bike lanes include the long-held notion that cars will “right hook” cyclists and therefore endanger them. However, cities from New York to San Francisco have addressed these concerns by educating motorists, providing adequate signage and markings, and ensuring a clear line of sight for drivers. At a recent Fulton Road meeting, city staff stressed that the $8 million in funding comes from highly competitive grant funding from the Ohio Public Works Commission and can’t be stretched further. Yet Vanterpool says it’s exactly in projects like Fulton that the city needs to push the envelope and experiment a little bit. After all, adding bike-protected lanes is probably a tiny fraction of that amount. Mortenson is optimistic and says the city’s approach may be pragmatic, but it’s not close minded. “By making it an inclusive process, they’re signaling that they’re open to progressive ideas,” he says. For all the optimism, Mayor Jackson isn’t exactly jumping on board, clearly. But perhaps the table is being set for the city’s next leader, who will hopefully be openly committed to making the city’s streets safer for everybody, no matter how they get around. Zone — whose name is being mentioned as a possible mayoral candidate in 2020 — says that it will take time and counsels residents’ patience. “When I floated Vision Zero, half the people in city hall didn’t know what the hell I was talking about … it’s like turning the Titanic,” he says.